A smile caught Krista Kilburn-Steveskey’s eye and she decided that was a player she should try to recruit for her Hofstra basketball team. Of course, it didn’t hurt that the player poured in seven points in the final minutes to pull out a win. And now the Pride, from Hempstead, N.Y., are opening the basketball season at Gonzaga on Friday and sticking around to play at Eastern Washington on Sunday. The reason is simple: Kate Loper. The sophomore from Post Falls is the player that Kilburn-Steveskey noticed during a summer tournament in Washington, D.C. The coach was there to check out a player from just down the street who happened to be playing against the Spokane Stars. Loper stole the show. And she just had to see more of the player that was always smiling. Rules prevented the coach from calling to make her intentions known and judging Loper’s interest, but she thought it was worth a “shot in the talk” to keep up with Loper. The rest is history, although bringing a player home is usually reserved for later in careers. It also reunites Hofstra star Shante Evans with Gonzaga leaders Kayla Standish and Katelan Redmon, all teammates on the recent U.S. Pan American team. “You never would have planned that in a million years, would you?” Kilburn-Steveskey said. Gonzaga coach Kelly Graves said the Hofstra contract is a two-for-one. After the Zags play in New York next season, the Pride get a return trip to Spokane for Loper’s senior year. 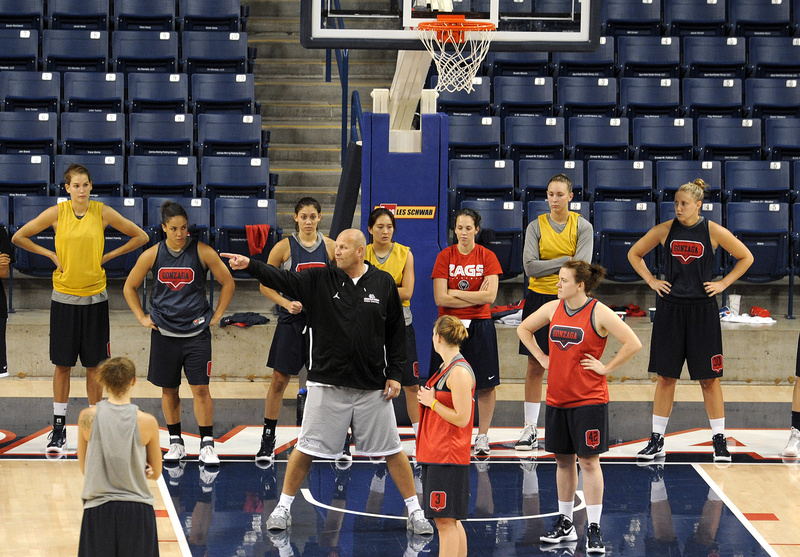 After its opener, Gonzaga heads to Stanford to face the fifth-ranked Cardinal on Sunday afternoon. This is the start of the second home-and-home between the teams and Graves said there will be a third. That doesn’t happen often between national powers and “midmajor” opponents unless they’re neighbors, or at least in the same state. Another factor is Cardinal coach Tara Vanderveer, who isn’t afraid to play anyone, particularly anyone good. Gonzaga, which sold out the Stanford game last season, now has a season-ticket base of more than 4,000. The Bulldogs are also in the midst of a six-year run with USC. The 23rd-ranked Trojans are in Spokane on Dec. 4. The Zags play another storied program, No. 13 Georgia, on a neutral court in Las Vegas the week before Christmas. Two years ago, that’s where they got to play Texas A&M and Baylor. No. 9 Louisville, which lost to Gonzaga is the Sweet 16, is at Washington State on Dec. 19. The Cougars play at Ohio State, a traditional Top 25 team that starts this season just out of the rankings, on Dec. 22. Ohio State is the alma mater of Cougars coach June Daugherty. Lexie Pedersen, a junior from Shadle Park, has decided not to continue playing at Washington State to focus on school. … Sarah Kliewer, a junior from Lewis and Clark, left Portland after two years and transferred to Holy Names in Oakland, an NAIA school. She went with Portland assistant Catherria Turner, who is the new head coach of the Hawks. … Lewis and Clark alum Brittney Kennedy, who played two years at Oregon State, will be eligible at the end of the semester after transferring to Florida Gulf Coast. … Washington State opens Friday at Penn State, facing the Nittany Lions in a tournament. The Cougars will play Middle Tennessee or North Carolina-Wilmington on Sunday. … Corban is at Eastern on Friday and Idaho on Saturday for openers.